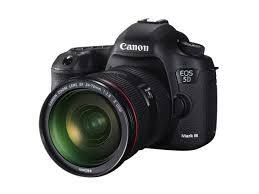 Canon has announced updated firmware for the EOS 5D Mark III. Firmware v1.1.3 makes an unspecified change to accommodate the EF40mm F2.8 STM pancake prime lens announced earlier this month. Beyond this, the update fixes a series of bugs and corrects a series of linguistic errors in menu screens. The firmware is available for download from your local Canon support site now. Fixes a phenomenon in which the camera's power may not turn on when a super-telephoto lens *1 is mounted to the camera with an extender*2. Corrects mistakes in the Dutch, Italian, Korean, Norwegian, Polish, and Swedish menu screens.